In a recent paper, Tennie and colleagues provide new data with regard to the concept of cumulative cultural learning. They set out to find evidence for a cultural “ratchet”, a mechanism by which one secures advantageous behavior seen in others, while simultaneously improving the behavior to become more efficient/productive. This is most commonly done through diffusion chains, as is done here. The authors rounded up 80 four year olds (40 male, 40 female) and sorted them into chains of 5 kids each; leaving them with eight male and eight female chains. What follows is what I took away from this paper. The kids’ task was simple: Try to fill a bucket with as much dry rice as possible. Two kids would be in the room at a time. Kids who completed their turn would swap out for kids who were new to the task, so that there was always 1 kid filling the bucket and 1 kid watching. 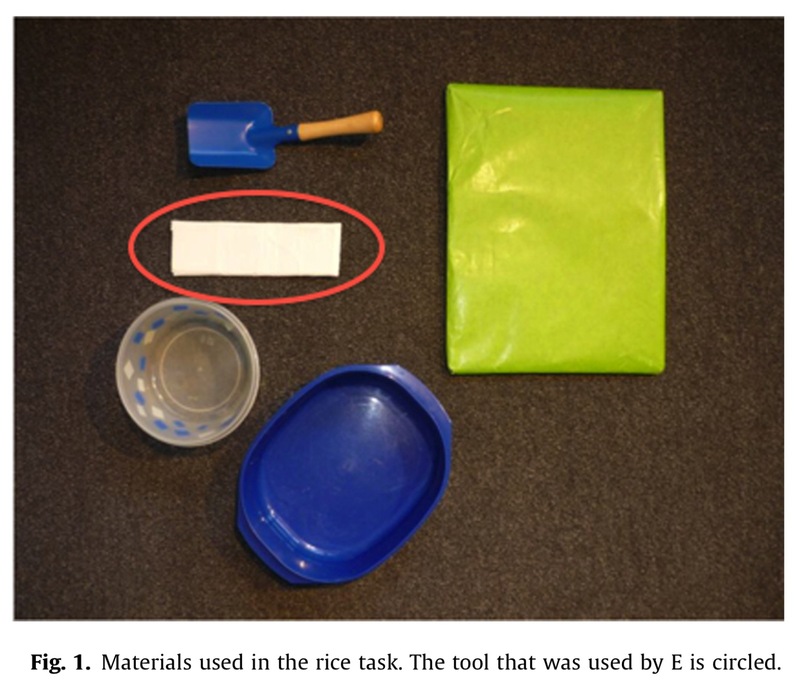 The kids were given different tools they could potentially use (see their figure 1 below). Some tools were obviously better than others, carrying capacities: Bowl – 817.5g, Bucket – 439.7g, Scoop – 63.9g, Cardboard – 21.5g. In half of the chains, the first child saw an experimenter use the worst tool of the bunch (flimsy cardboard, circled in the figure) and the other half didn’t get a demonstration at all. As always, you can click on the figures to enlarge them. As the authors said, “A main question of interest was whether children copied [Experimenter]’s and/or the previous child’s choice of tool or whether they innovated by introducing new tools”. In other words, evidence for a ratchet effect would manifest in later generations using more productive tools than the earlier generations. Another interest is whether this innovation differed between conditions- those that had an experimenter demonstrate or not. Not sure why this manipulation is interesting, seeing as the only kids who see the experimenter perform the task are in Generation 1. Without even going into the stats, I don’t see much evidence that kids are ratcheting. Most chains in the baseline show the following pattern: Generation 1 uses tool X and all subsequent generations use tool X. Two chains manage to break the imitation spell, both switching from scoop+bucket to scoop+bowl. The experimental group shows a similar pattern, where the kids either all copy generation 1 (who copied the experimenter) or one adventurous kid in the chain decides to switch tools and the rest copy him/her. Interestingly, the chains in the experimental group only ever switched from the cardboard to the scoop, effectively going from the worst tool to the second-worst tool. If these kids were trying to score the most rice, wouldn’t it be best to switch to the bucket or the bowl? Weird. The authors propose that kids in baseline didn’t innovate across generations because they were already performing at a high level in generation 1, so they didn’t have room to grow. 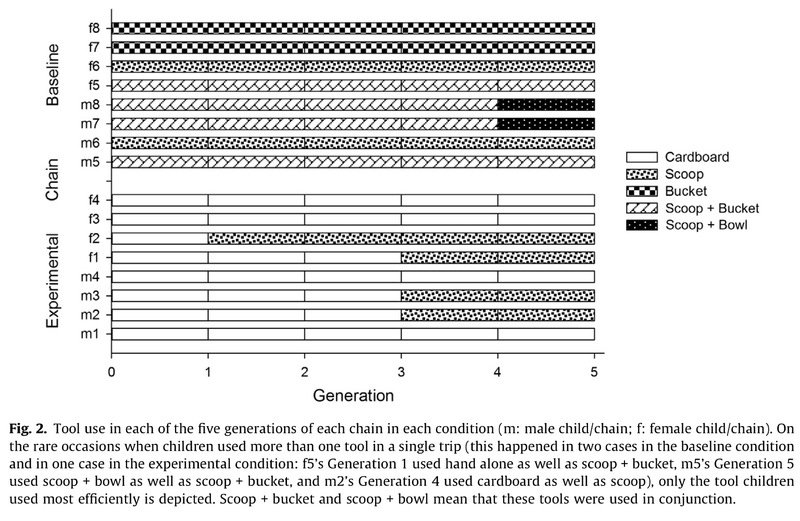 Well, the only chains who did actually innovate in baseline started with scoop + bucket (second highest capacity tool) and went to scoop + bowl (highest capacity tool). Further, the chains in the lowest starting position, scoop only, never innovated. Overall I thought the experiment was cool. Rounding up 80 four year olds is not to be scoffed at. But I don’t agree with their claim that the baseline group was at ceiling and I don’t see much ratcheting in the experimental group (who all start with the worst tool).